The seventh Course at Mélisse consisted of celtuce (celery lettuce, but really just a big stemmed celery), maitake mushrooms, jus de rôti (juice from roast), mustard sabayon (a very light custard). I’ve had monk fish before. It’s a very firm texture fish and is difficult to cook. Most of us are familiar with monk fish (ankimo) from their liver which is served often in sushi bars. This is the first monk fish dish I really enjoyed that did not incorporate the liver. The fish was expectedly firm, but the jus, vegetables and sabayon really complimented what is usually an oily and seemingly bland fish. Monk fish is very difficult to not over cook. I’ve had monk fish that has been cooked so that it’s almost rubbery with no flavour. 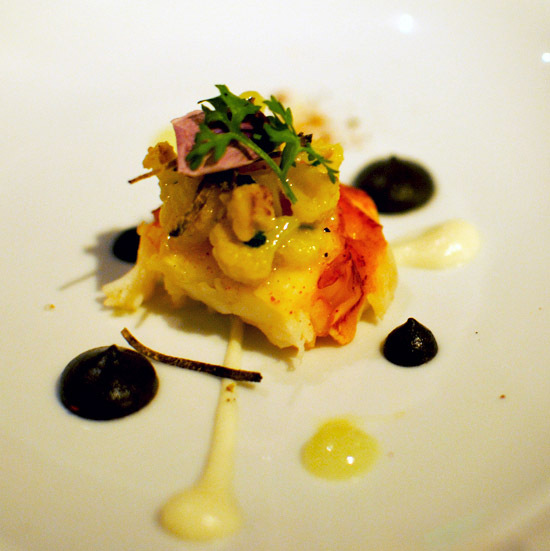 This dish however, was remarkably savory with a texture between cod and lobster. 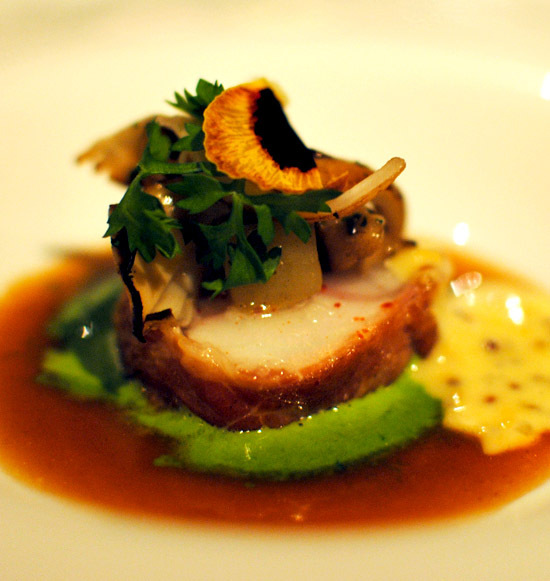 The celtuce is a puree under the monk fish. A great dish, but not the best that we had at Mélisse. Located in Santa Monica on Wilshire near Lincoln, this well known restaurant has 2 Michelin Stars as well as numerous other dining awards. 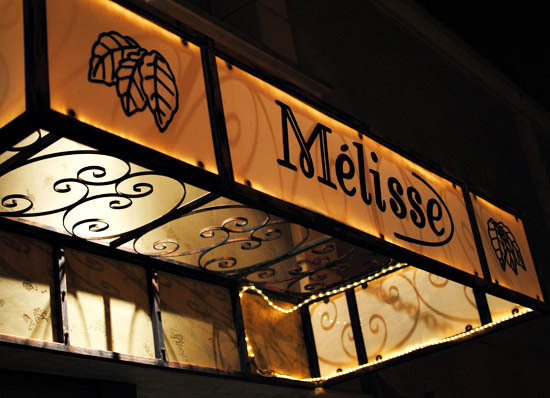 The word mélisse is the name of a lemon-scented mediterranean herb, and I assume looks similar to the 3 leaves next to the name painted all over the outside of the restaurant. 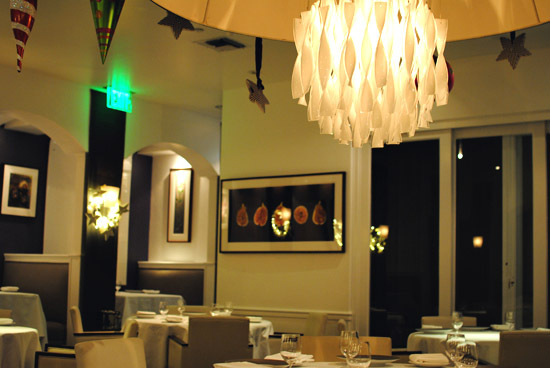 The style of the cuisine is self-described as American/French contemporary with hearty french influences. Their menu includes a normal tasting menu, carte blanche tasting menu, vegetarian tasting menu, à la carte menu, dessert menu and a full bar and wine list. My sister’s good friend Sue was working here at the time so that was one of the reasons that influenced our dining decision, also my sister gave us a generous gift card so we opted for the carte blanche without the wine pairing, knowing that finishing will be a challenge in itself. Thanks Sis! We started dinner a little past 9pm. Shortly after we sat down, the waitress asked us if we had any fewd preferences. 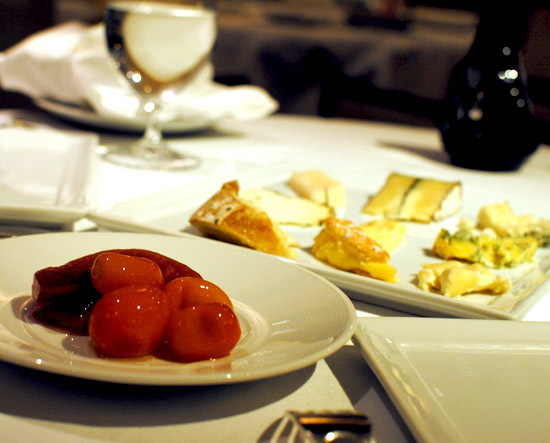 We requested not to have tomatoes and to that she responded by bringing out our amuse bouche. Grape, with goat cheese and pistachio crumbs. Most people know that fruit with cheese and nuts is a great combination and this was a pretty good start the circulation to our taste buds. Later on, I find out that usually this has tomato instead of grapes, I’m glad we got grapes. Second amuse bouche was yellow tail sashimi with yuzu sauce, , radish, masago and a type of seaweed I am not familiar with. The light flavour of yellow tail is really complimentary to the citrus of the yuzu. The masago adds saltiness as well as small flecks of sea salt on the fish. 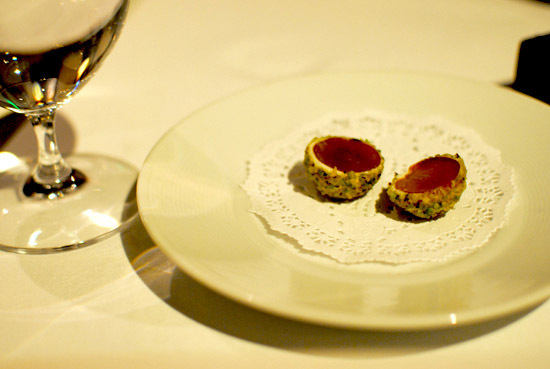 A more savory amuse bouche, my palate was really going at this point. Bear in mind this is a 13 course meal, so there are going to be a lot of dishes. 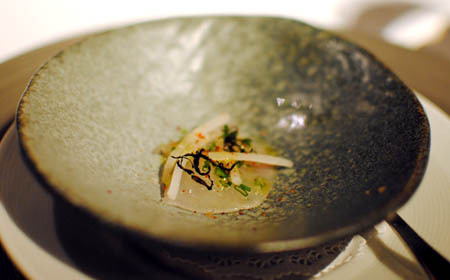 So course one was a raw scallop with Osetra Caviar and sliced radish and yuzu juice on top. Osetra is a sturgeon and a relative of the more famous Beluga sturgeon. It’s a bit more firm than Beluga so it’s almost like eating a mouthful of pop rocks, except it’s savory. 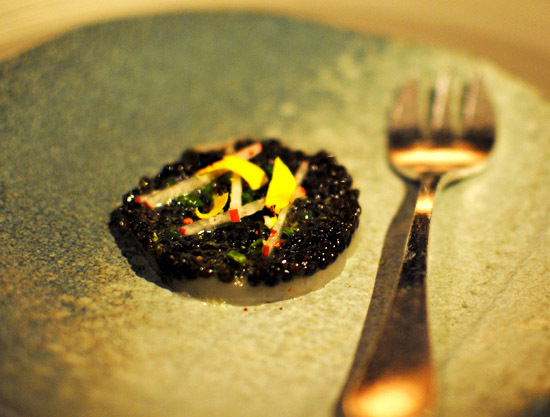 This also seemed like an amuse bouche and incredibly similar to the second one except it’s scallop with a heaping amount of caviar. The caviar made it worth it. Next course was a Fennel Flan with an orange gelée and a cashew foam. This looks like a very sweet dessert. 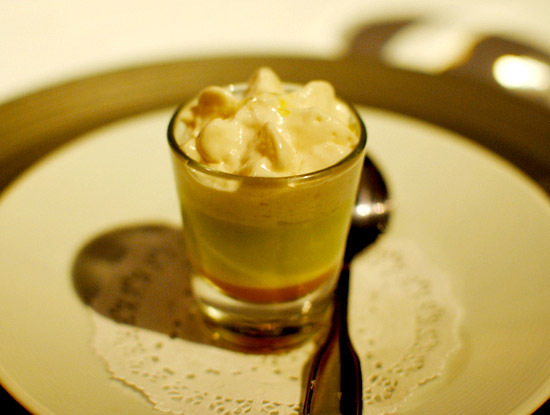 The cashew foam is expectedly nutty, with a light texture but not flavour. When you get to the Fennel, it’s kind of eggy and salty. I didn’t hear the waitress very clearly say there was an orange gelée so when I hit the bottom, I was thinking, what is this strong familiar flavour and was quickly informed that it was orange. It didn’t taste like orange to me completely, but more of just the tart bite of orange. It seemed to me the orange part had been altered by the way it was prepared. Eating all 3 layers together blends these 3 very different flavours together but you can still taste every flavour individually. This course was incredibly interesting and gets a person to think about taste and flavour quite a bit. Third course! 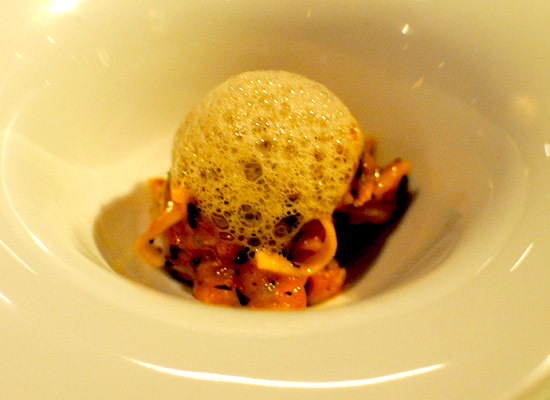 Chestnut soup with crème fraîche, tortellini, chestnut crumble and Périgord truffles. 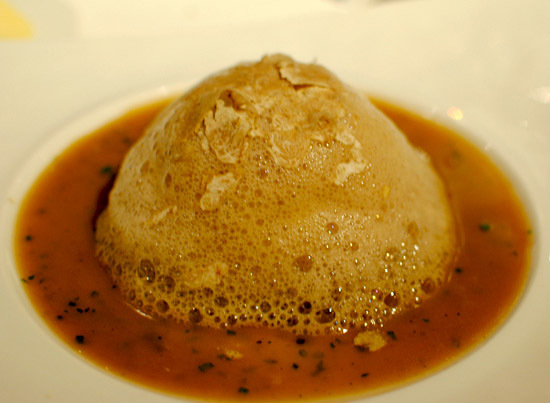 This pictures shows the soup after they scraped generous portions of black truffles into it. Périgord is a region of France where these truffles are exclusively grown on oak trees. Tortellini was the best kind of al dente, obviously hand made, with a creamy light cheese filling. The soup was very creamy with the crumbles giving it a bit of a nutty flavour as well as a gritty texture. This was an amazing soup, I wish it was twice the portion size we received. Fourth course was a stainless steel spoon. 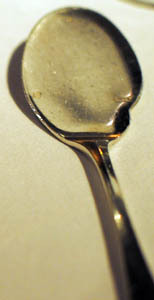 Actually it was truffle egg, but this was the special spoon that is given to us for sopping up the truffle infused jus. Brioche is a brilliant second alternative to the spoon for sopping up the sauce, but thankfully we were given the spoon or the amount of bread needed would be almost diabetic to absorb that much jus. An egg is an egg is an egg is a Truffle egg. 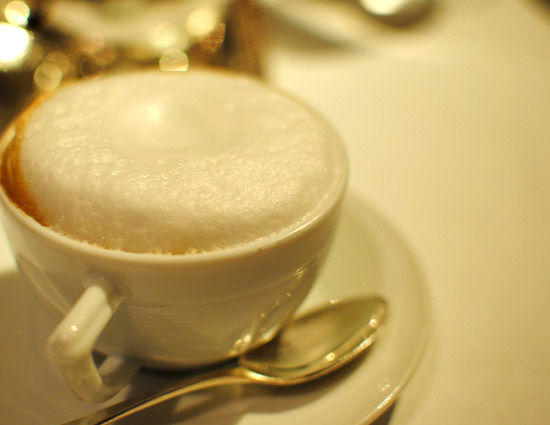 Melting organic egg, shaved white truffles, truffle froth and also jus de rôti. After the dish is served with it’s incredibly ridiculous looking spoon and garlic toast-like brioche, waiters arrived with two boxes to shave black and white truffles all over the egg. I first tasted the jus and truffle foam, the foam of course is quite light with a hint of truffle aroma unless you get a big piece of truffle shaving with it. 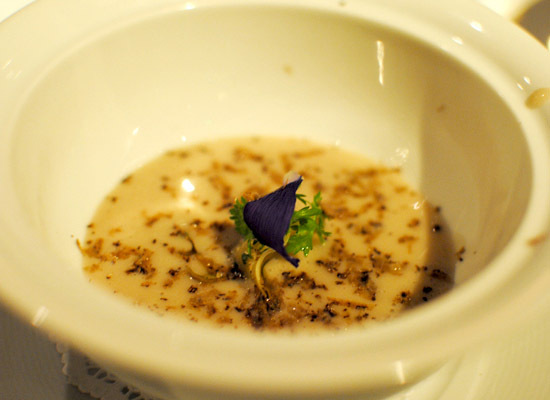 The jus is very savory with flecks of black truffle in it from the shavings, quite delicious. The egg is cooked in a special way that the white is aerated so that it’s a little more than twice the size of a normal egg yolk, it’s almost cake like, and the egg yolk inside is creamy like a sunny side up egg. This dish is quite over the top as far as truffles go. The taste of truffles is all over the dish. If you like truffles, you will love this dish. 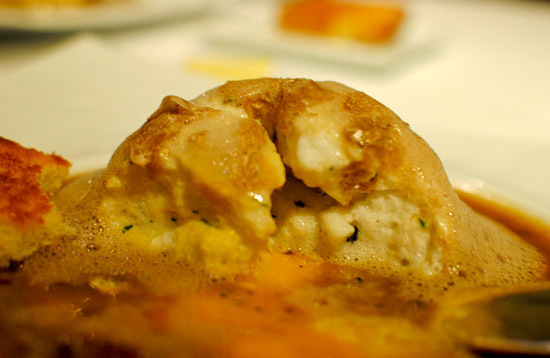 The egg itself is not very flavourful unless mixed with some jus or truffle foam. I think the egg to me is just a delivery platform for a truffle overload experience. The foie gras is paired with persimmon compote and gelée in the middle, rhubarb top left and quince on the bottom left. 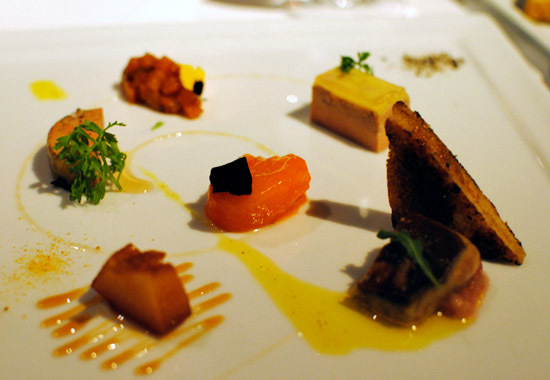 The types of foie gras were seared with a piece of brioche on the bottom right, paté on the top right, and terrine on the far left. On the plate was salt and pepper, olive oil and reductions of each pairing fruit or vegetable. 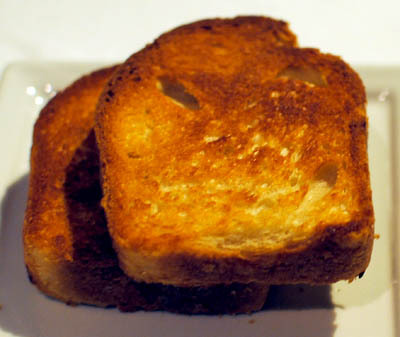 My favorite pairing was the seared with quince and toast. 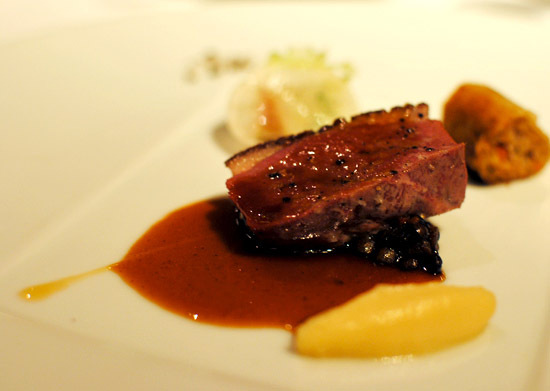 Seared foie gras has always been my favorite though. The terrine and paté were similar with the terrine having a more coarse texture. 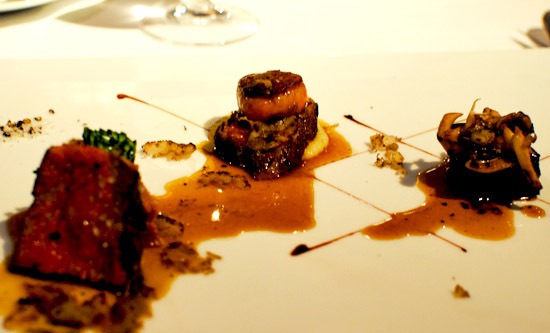 The pairings on this plate are very well thought out with foie gras being very rich and often seasoned savory with a fruit or vegetable reduction that is very sweet. Everything on this plate was very rich showcasing the main feature of good foie gras. Duo of Lobster consisted of lobster bolognese and lobster eached served separately. The lobster curry had really firm lobster meat and the curry wasn’t an incredibly strong curry. It was closer to an indian curry. The bolognese with truffle foam was incredible. It was perfectly seasoned allowing the lobster flavour to mingle with truffle, beef and salt. The capellini pasta was fresh made also with that nice al dente texture. Next time I’d like a duo of just lobster Bolognese please! The seventh course is described at the beginning of this post. Liberty duck, lentils du puy (French green lentils) , turnips, and ruby red grapefruit. Liberty is a brand of duck that feed and treat the duck similar to free range chickens which takes the duck longer to grow, but is supposed to impart more flavour in the duck’s meat. Also there is half a duck eggroll behind the breast. The egg roll was crispy and savory. The duck breast matched well with the tart and sweet sauce. It was a nice cut with skin and fat attached to it. The one thing I don’t like about duck breast is often it’s texture. This was the same as it was a bit tough and chewy, but the flavours were good. I actually liked the egg roll more than the breast portion. Course 9 consisted of filet (left), braised short rib (right), côte de boeuf/rib of beef (middle under bone marrow), bone marrow (middle on top of côte) and red wine herb jus (all over the plate). Wagyū beef is the richest most marbled of all types of beef. This was evident with this dish, one of the best beef dishes I’ve ever had. The filet was far more juicy and tender than a normal filet. This filet was seared on the outside with nice and pink meat inside. The taste was as juicy as a ribeye cut. The côte de boeuf is basically a prime rib type cut but grilled. It’s a more dense piece of meat but used because it compliments what is placed above it. A small gob of gelatinous brilliance, er I mean bone marrow sits on top of the côte de boeuf. It’s seared on each side like foie gras and is similar to in texture but much softer. When you place the bone marrow in your mouth, it quickly diffuses into a rich luscious juice. When people say “literally melts in your mouth” they are lying unless they are talking about bone marrow, this is the real deal. Paired with the more dense côte de boeuf, it’s a perfect match eaten together, like eating a delicious fatty piece of beef but it’s bone marrow and far more rich and delicious. The braised short rib was covered in a layer of sweet reduction that gave it’s falling off the bone richness a very complex signature. When you cut into the short rib, the inside is nice and pink and the meat falls off in neat little strips. It’s hard to choose a favorite among these 3, but I would have to say the most unique is definitely the bone marrow. Basically you have a wonderful cut of beef cooked perfectly and complimented with a delicious red wine herb jus. Next you have a kind of deconstruction of that wonderful piece of meat, almost separating the meat from the fat with the cut choices paired together. Then you have finally a distillation of that knowledge in the complex flavour and longer cooking time of the masterfully prepared short rib. Oh, and if you didn’t notice there are large pieces of black truffle shavings all over the plate. Also there was a vegetable puree of some sort next to the short rib which was decent but we barely noticed it since we were busy wishing this was an endless plate of wagyū beef. A very bold cheese plate according to our waiter. Fromage was one of the biggest courses. 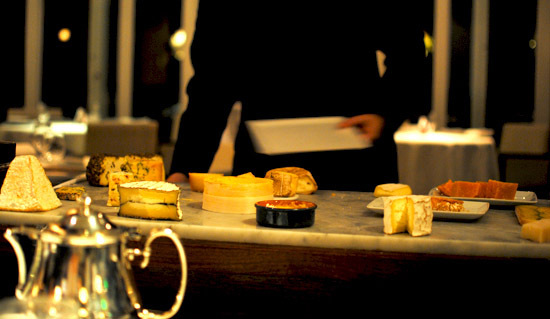 We were allowed to pick four cheeses from the sheep and goat side and four cheeses from the cow’s milk section. The waiter added an extra cheese in the middle for us to taste. The cheese were served with preserved fruits, the large purple one I believe was a quince and the orange ones might have been apricots, I didn’t eat very much of those as I was busy putting cheese on bread and stuffing it in my mouth. I must say at this point I was already quite stuffed. We did not get the names of all the cheeses so I will not try and bring shame to the name of all these wonderful cheeses. Basically, the cow’s cheeses could get super stinky, one was so bad we called it HK foot cheese, but the more we ate them the better they tasted. The sheeps milk cheeses were more of a mid tone flavour, but the different aging process of all these cheeses gives every one a very distinct flavour. I could not decide which one I liked best, each one I tasted was my favorite. 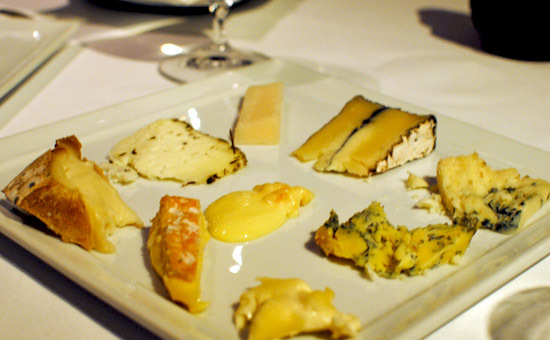 Any one of these cheeses would be welcome to my house for dinner any day of the week. After this course, we figured it was the dénouement. We were so incredibly wrong! Course 11 was simply mind blowing. On the menu it’s a simple Vanilla Yogurt with strawberry sorbet. 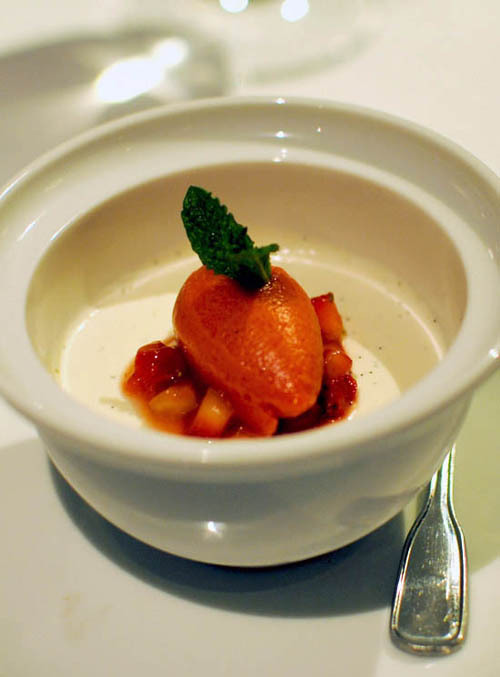 In your mouth it’s an incredibly refreshing and cool vanilla yogurt with a tart and not too sweet strawberry sorbet. Again, the strawberry sorbet doesn’t have the overwhelming flavour usually associated with it. It was more of a lighter flavour that gave the vanilla room to bloom together when eaten. The yogurt itself was very creamy with a consistency similar to boiled milk dessert we’ve had in Hong Kong. You can taste each fleck of vanilla bean in the yogurt. Yes, a very simple on paper dessert. Something completely different and wonderful when eaten. We got a little break from the courses with a nice coffee. This one had a really stiff foam! 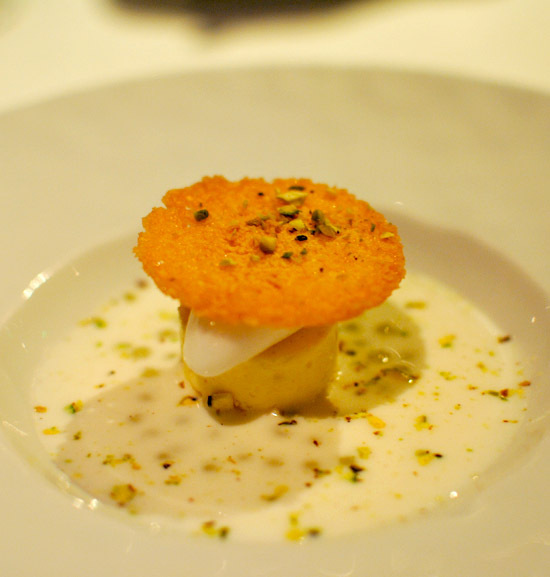 Twelfth course was frozen passion fruit parfait with pistachio, coconut in a lemon grass broth. You can see the bits of pistachio everywhere. The frozen passion fruit was basically passion fruit ice cream sitting in a lemon grass milk soup with a coconut sorbet sticking together the pistachio cookie on top. I enjoyed the playfulness of this dish. The general taste of this dish is pretty sweet and nutty. The one complaint I had was that the cookie is a bit rough and abrasive. Final course was chocolate souffle, chocolate peanut butter crunch, coffee and mascarpone. 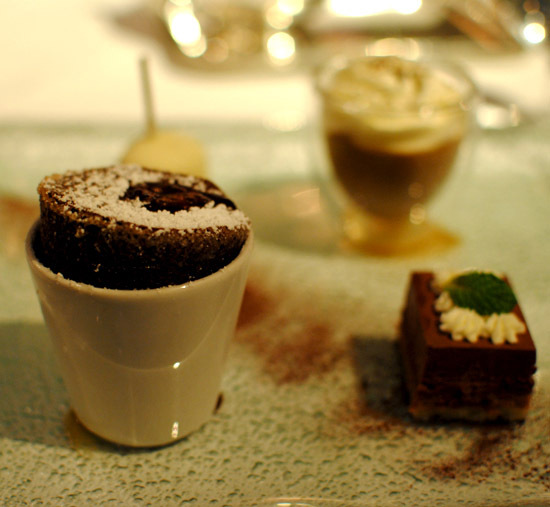 The souffle is similar to a lava cake, the crunch is sweet and wafer-like and the coffee and mascarpone was my favorite, with a cool light consistency and creamy and cheesy mascarpone. This was a more suitable dénouement to the incredible meal we just had. These are snacks served to go with the after dinner coffee. 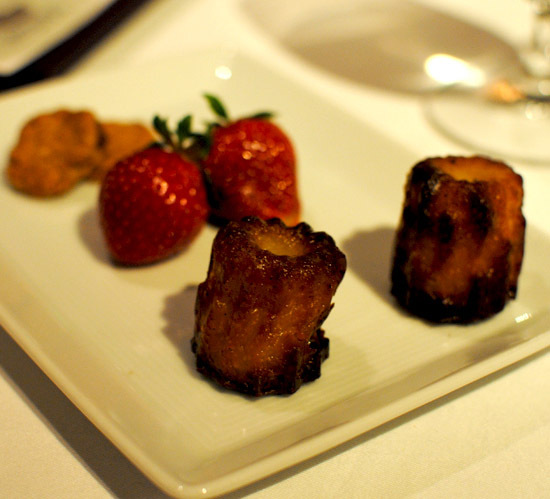 Cookies were a bit hard, strawberries fresh and cannelés bordelais was chewy and sweet, quite nice with a cup of coffee. Overall our favorites were the wagyū beef, trio of foie gras, and vanilla yogurt. Plankton liked the Frozen Passion fruit parfait quite a bit also. I’ve read that sometimes owner/chef Citrin comes out to greet the guests but it seemed like he was not in house that day. I did see Chef de Cuisine Takayama wiping his brow outside after the meal. It seems the menu at Mélisse changes quite often so it’s worth it to visit again and again. It might be a bit more affordable if one goes there and gets the tasting menu the first time and then try new items à la carte on later trips. If you eat here à la carte it seems only a little more expensive than going to a pricey steakhouse so it’s not that bad. Hours: Open Tue-Thu 6 p.m. – 9:30 p.m. Fri-Sat 6 p.m. – 10 p.m.
Closed Sundays, Mondays and Lunch but available for private events. 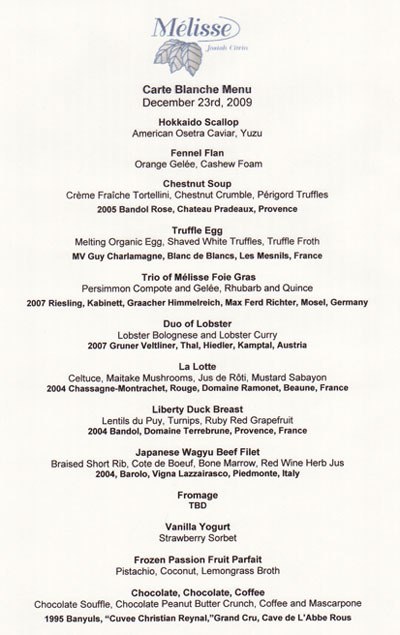 Pricing: Very High but still a good value considering the tasting menu is 105 USD. The price goes up from there with menu additions and the carte blanche menu starts at 200 USD a head not including wine pairings. Food: Incredible, fewd this good should be illegal. I can never look at beef the way I used to. Signature Dish: The truffle egg here is quite famous, but to me the real stars are the wagyū beef dish, foie gras, and the vanilla yogurt. Facilities: Exterior reminds me of spanish adobe houses maybe because of the stucco paint. The interior is dimly lit for romantic dinners, seating is well spaced giving the diner a sense of separation from diners just a table away. Decor is almost like a nice modern nice hotel room with paintings of deconstructed fruits and vegetables. Service: Our experience here with service was phenomenal. At this high of a price point, it should be and Melisse delivered. We also arrived after the dinner rush and basically stayed way after hours so that might be a factor also. rc8THQ Some truly quality articles on this internet site , saved to fav.